Quick Breakdown: An excellent retro platformer that shouldn’t be missed by anyone who’s a fan of the genre. 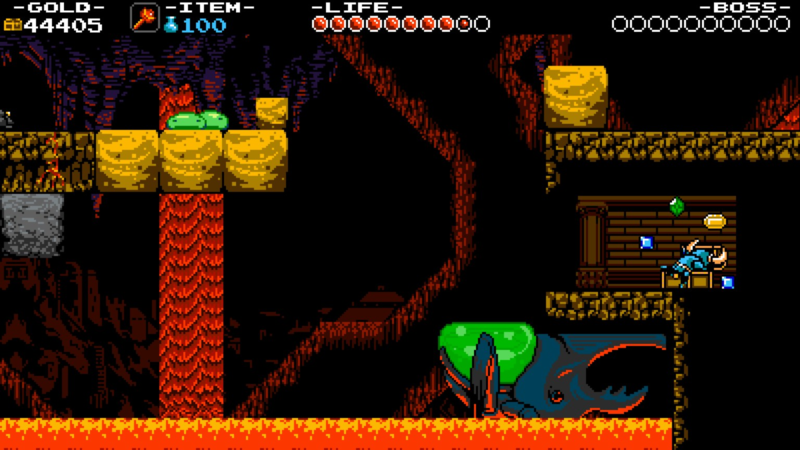 Full Review: Shovel Knight is a retro platformer in the vein of many old NES games, and it’s pretty clear and unashamed that it draws its influences from such. As someone who grew up playing games of that sort, and still loves them to this day, Shovel Knight had me sold from the moment I first saw the trailer. Gameplay-wise, it’s most similar to Mega Man in terms of its platforming, though it differs greatly in its combat. Instead of a buster cannon, you battle with the aid of your trust shovel, which functions as a short-range melee weapon. There’s also an assortment of relic items that can be found and purchased to aid you in your quest, with most functioning as additional combat weapons, though some serve other purposes. Gold (your currency) is accumulated by picking up gems, gold, coins, and the like throughout the levels. In addition to purchasing the relics, you can also use your gold to purchase armor, shovel upgrades, health upgrades, and magic upgrades (magic is consumed to use the relic items). And of course, what would a retro platformer be without 8-bit graphics and an old school style soundtrack? 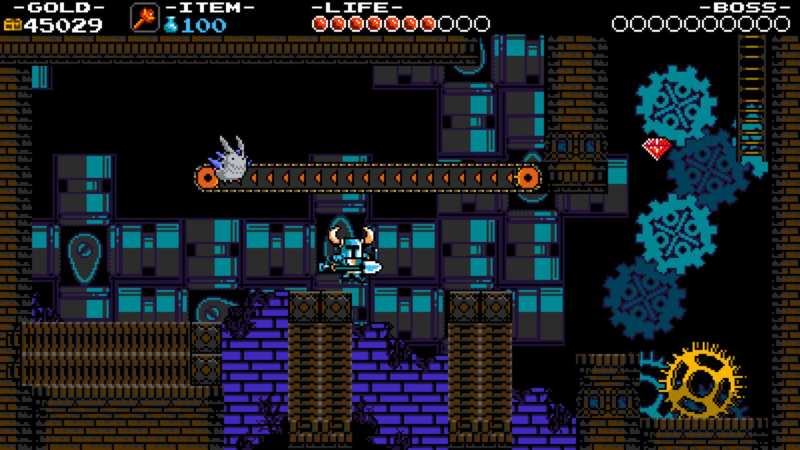 True to its influences, Shovel Knight has both in spades. The graphics look like a later-era NES game, and will please anyone who’s a fan of that art style (I myself am quite fond of it). The music as well is pretty great. The main difference I notice between this and the NES games it harkens back to is that it has a far more reasonable difficulty than its ancestors, which were downright brutal at times. Now, I’ve never been one to mind a difficult game—I even have an affinity for them—but having less time to play games than I used to, I must confess that I’m glad that the game’s difficulty is much more moderate. The game doesn’t utilize a life system or limit your number of tries per level before forcing you to restart the whole level. Instead, dying merely causes you to lose a portion of your gold (which can be regained by grabbing the floating bags of gold that hover by your place of death—so long as you manage to do so before dying again) and sends you back to the last checkpoint. However, many of those old games were so difficult simply to increase one’s playtime with them, as they were rather short. 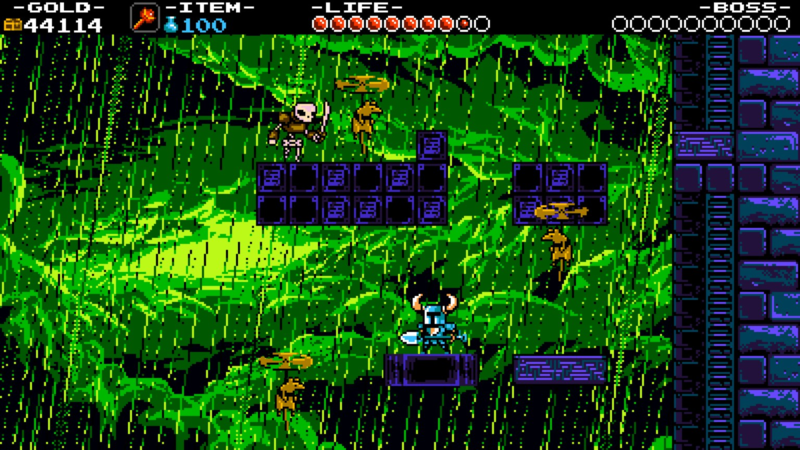 Shovel Knight itself is not a long game, as it’ll only take about 5-6 hours to complete the main game once. Thankfully, it’s a very fun 5-6 hours. 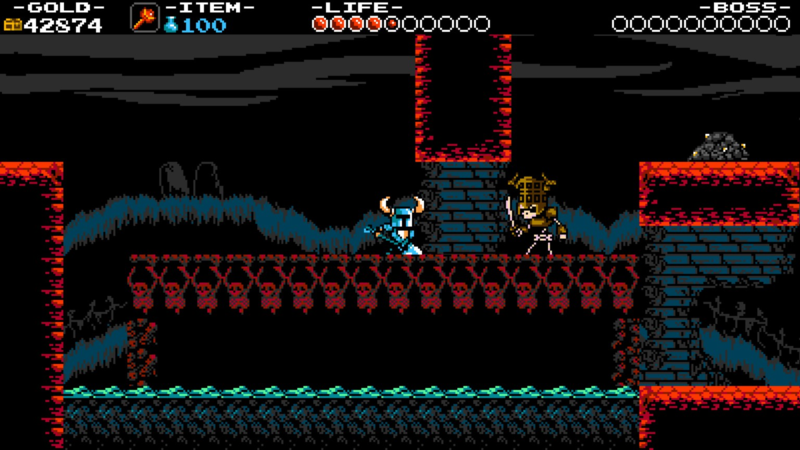 In the end, Shovel Knight is a stellar platformer that will be enjoyed by anyone who’s a fan of the genre, especially those who love the old NES games it emulates.